Second Largest St. Patrick’s Day Parade in the World! 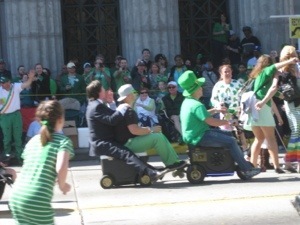 Today I decided to venture to Savannah for the second largest St. Patrick’s Day parade in the world. Supposedly only New York City’s is larger, but some locals like to contest this. Savannah’s first parade was held in 1813 by a small group of Hibernians. Now the parade consists of 350 units. The parade is always held on March 17th, unless the 17th falls on a Sunday, in which case it is held on Saturday the 16th…a perfect scenario for me! Being an out-of-towner, not familiar with the area, and having to deal with a mass of 500,000 people congregating into a 2 mile parade route, I was not quite certain I was going to enjoy the hassles of driving and parking while trying to follow directions on my smart phone! I was lucky to have spoken with an old colleague whose daughter attends SCAD, and he suggested I go to the Westin on Huthinson Island and take the River Ferry across. Not a bad idea, I thought, especially, since I was coming from the north and have a Westin parking pass from Hilton Head. His idea was golden! The convention center was next door to the Westin and parking was $15. Multiple ferries were operating. 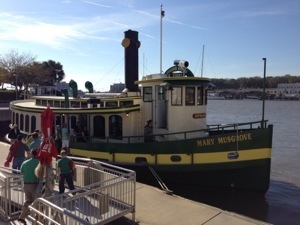 I waited in line for the next one, cruised across the river in a few minutes, and disembarked on River Street. I walked around the store front, up the narrow stairs, and found a place on the already packed Bay Street just in time for the parade to start at 10:15! I was toward the end of the route, so I didn’t expect to see any participants for an hour or so which proved true. In the meantime, I just watched all the celebratory spectators. Amazingly they were rather tame given it was suggested that anyone who wanted a shady spot in a square should arrive at 6 a.m. and anyone who wanted a shady spot on the street should arrive at 7 a.m. 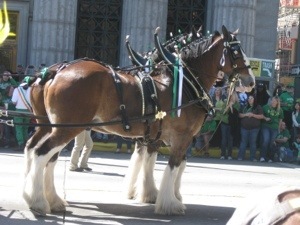 The parade included multiple Irish bagpipe bands, high school bands, floats, The Bulldogs (all the way from Indiana), prior parade masters, the bishop from the Catholic Diocese of Savannah, the military, and my favorite – the Budweiser Clydesdales, to name a few! 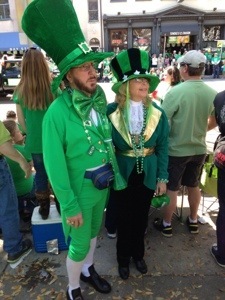 Of course, it wouldn’t have been a St. Patrick’s Day parade without spotting a leprechaun…there were plenty! While I hear the parade lasts for 3-4 hours and I’m certain the party continued on River Street, I only stayed for a few hours as I had a more important event waiting at the Country Club of Hilton Head later in the evening! slow friday afternoon, make that thrusday afternoon. so you have an ex-colleague who know someone who attends SCAD… wonder who that is. Did you want me to put your first and last name in there so the public can google you? :-). I guess it is pretty generic (no offense). ‘Search probably turns up lots of pages!